Altron Bytes Document Solutions (BDS), the largest Xerox distributor in the world, has won the Xerox Middle East & Africa (MEA) Partner of the Year Award, the Xerox Managed Print Excellence Award, and a shared award for Xerox Production Excellence for 2018. 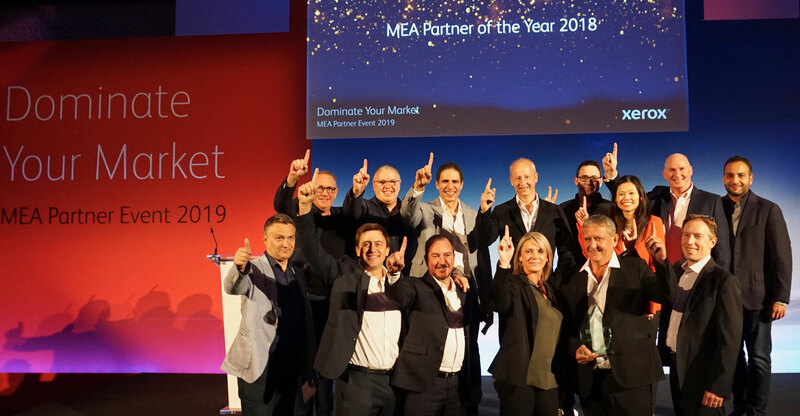 These awards were presented at the Xerox MEA Partner Conference that was held in Madrid, Spain in April 2019. The Xerox MEA Partner of the Year Award is contested across 80 countries and given to the partner who best exemplifies among other criteria: revenue growth, account management, balanced operational performance, robust business plans and strong brand representation and stewardship. Market coverage, service modernisation, business model evaluation and value proposition are also evaluated. “Altron BDS has once again demonstrated exceptional performance in the Xerox MEA region, which was achieved against a backdrop of tough global and regional economic developments” said Johan Basson, MD of Altron BDS. “These results demonstrate the critical importance of a strong, dedicated, loyal and professional team, and I am honoured to lead such a committed and skilled group of people. I would like to thank my employees and all our business partners for contributing to this success. This is the highest honour bestowed upon a partner in Xerox MEA and highlight the fact that Altron BDS is among the top Xerox partners in the world and certainly the best in the MEA region. “It is a privilege to celebrate the successes and growth of our partners and to reward excellence for 2018”, said Kevin Gould, regional manager, South & Central Africa, for Xerox MEA.